After James Nicol appeared as a guest on my podcast and I first heard about this book, I've been dying to read it - and it has seemed a very long wait. The book finally turned up a few days ago on my birthday and today I actually had time to sit down and read a few pages. That was the intention anyway. Just a taste. Now it's several hours later and I've read the entire book. I sincerely hope there's going to be another one in the not too distant future! 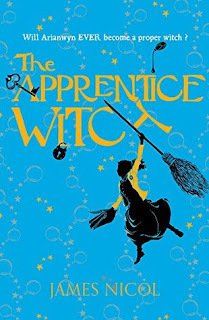 The Apprentice Witch is one of those books that transcend time and age group - very much as Harry Potter or Philip Pullman's His Dark Materials do. There is something here that will resonate with anyone who has ever felt 'no quite good enough' or been wracked with self-doubt or just felt they haven't measured up against their prettier more popular peers. I loved this story. The world building was great with tantalising hints of a much larger world and a seamless blending between modern and old fashioned devices. The book is peopled with great characters - Arianwynn especially but I also loved Ms Delefield and Colin (who I hope we'll see more of in future books *fingers crossed*) The magic system is well imagined and evoked, and I loved all the different spirit creatures. Nicol really makes you feel for his MC so that by turns you are embarrassed, frustrated, amused and finally cheering her on to a grand finale. This was one of those rare books where I found myself smiling as I read it. Well worth the wait. Highly recommend this to fans of Harry Potter, Diana Wynne Jones and anyone who loved Kiki's Deivery Service.